This set is exclusive to Conjured Cardea! I have worked very hard on these oils. 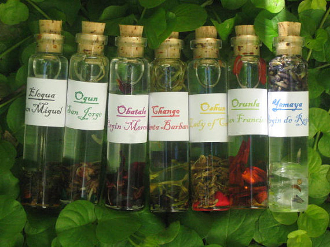 When I began to work with the 7 African Powers, there were virtually no oils available to use. What was available was mass produced junk full of dyes and with no actual correspondences to the Orisha themselves. So what made it "7 African Power" oil then? Nothing. It has taken me nearly 5 years to perfect the herbs, numbers, saints, colours and scents I use for these oils. A lot of research went into this oil and I believe it to be far superior than any other Orisha oils you will find. Information can be collected about these Orisha, but I experimented and tested each correspondence so I know they work! You will receive all 7 oils in this set, 2 fluid ounces each, in a charming glass vial with natural cork. Created from a rich coconut oil base and essential oils. Save some money! I sell these oils separately for $8.88 per bottle, you're saving over $20.00 it's like getting 2.5 oils free! A perfect way to stock your magickal cupboard and start working with these deities the right way! Some practitioners use "9 African Powers" including Oya and Babalu Aye. These oils are also available and can be included in this set for an additional charge. I will also sell these oils individually. So if you have a patron Orisha and just want the oil for him/her please convo me and I will reserve a listing just for you and your Orisha! Eleggua (Legba, Exu, Eshu, St. Michael) is the Orisha of crossroads, doorways, and gates. He is the messenger of the gods- no Orisha can be contacted except through him, and his dress and conflicting mannerisms reflect this double-sided nature (he is sometimes depicted with two faces, especially in Yoruban art). Eleggua is also the guardian of the doorway between the earthly and divine realms. He has been compared to the Greek God Hermes, with whom he shares many attributes, and to the Hindu Ganesha. In Brazil, he is sometimes equated with Baphomet, and his symbol is a pitchfork. In Lukumi, he is a guardian of doorways, and effigies of Eleggua are used to protect homes. Oil contains sandalwood, musk, cinnamon, patchouli leaf. Ogun (Ogoun, St George) is the chief of the warriors, the God of War, blood, and iron. He is the guardian of the forge, and the patron of civilization and technology. Not just a martial deity, Ogun is the archetypal force that drives technology. He is responsible for tools of progress like farming implements and surgeon’s knives. He is movement, impetus, force. Because of this, Ogun is associated with locomotives, and offerings are often made to him at railroad tracks. In Candomble, he is associated with St. George, the dragon slayer; in Lukumi, he is associated with St. peter. Because of his association with blood, Ogun is often petitioned for aid with blood diseases. However, because Ogun enjoys blood offerings, it is considered inadvisable to petition Ogun while menstruating or with a bleeding wound. Oil contains musk, frankincense, crushed nutmeg. Chango (Xango, Shango) is a warrior, the Orisha of lightning, dance, and passion. He is the epitome of all things masculine, and the dispenser of vengeance on behalf of the wronged. Shango was likely once a Yoruban King. He is associated with St. Barbara. His colors are red and white, and his best known symbol is the oshe, a double bladed axe. He is sometimes associated with Vodoun’s Petro Loa, Erzulie Dantor. oil contains Honeysuckle, cinnamon, and sandalwood, honeysuckle flowers. Obatala (virgin mercedes)is the creator God, of whom all of the Orishas are but aspects. His color is white, containing all the colors of the rainbow. He rules the mind and intellect, cosmic equilibrium, male and female. Obatalah’s counterpart in Vodoun, Damballah, takes the form of the primeval serpent. Obatala is considered to be beyond the sphere of direct communication; however, Damballah does possess his followers in Vodou rites. Damballah and his wife Ayida-Wedo, the rainbow serpent, are often compared to alchemical and yogic concepts of kundalini. Oil contains frangipani, ylang ylang, lily of the valley, hibiscus flower. Yemaya (Yemoja, Iemanja) is associated with the Virgin Mary, virgin regla and the goddess Isis, and the most beloved Orisha in Lukumi. She is the Goddess of the Ocean and the moon, guardian of women, childbirth, fertility, and witchcraft. She rules the subconscious and creative endeavors. Yemaya’s counterpart in Vodoun is called Lasiren, the mermaid. She is related to Mamiwata (Mama Water), the African water-spirit. Lasiren’s symbols are a mirror and comb, giving her an odd similarity to the Pictish sea goddess. There is a common legend about Yemaya choosing her own students- that occasionally someone will disappear, sometimes for seven years, and return with tales of having learned the ways of magick and healing in her undersea abode. This trope appears in many cultures’ legends of sea goddesses. In Lukumi, Yemaya’s colors are blue and white; in Vodou, blue and green. Her offerings are often doves, but never fish. Oil contains lavender, lily of the valley, rose, lavender buds. Oshun (known as Oxum in Brazil, Lady of caridad) rules the ’sweet’ waters- rivers, brooks, and streams. Oshun is closely related to Yemaya, and their aspects sometimes overlap. She is the goddess of love, passion, and sensuality, as well as money and prosperity. Her preferred offerings are honey, copper jewelry or coins (usually in multiples of five). She is most often associated with St. Cecilia, and in Lukumi, she is Our Lady of La Caridad del Cobre, the protectress of Cuba. Her colors are yellow and gold. In Vodoun, Oshun is known as Erzulie. Erzulie’s colors are shades of pink. While Erzulie and Ochun are very much alike, Erzulie has a vengeful, implacable aspect when angered. Her aspect Erzulie Dantor is a fierce protector of women, an avenger of domestic violence, and a patron of lesbians. Contains jasmine, neroli, cinnamon, anise seed. Orunla (st. Francis)is the Santeria God of Fate, owner of divination, and giver of wisdom to find solutions to all of life's problems. Orunala is likened to St. Francis of Asisi because of their simialr humbleness and simplicity. Orunla works transmitting the will of Olofi to those of us here on earth. All major decisions of the religion must have the approval of Orunla and an individual's guardian angel must be determined by Orunla though a specialized ritual consulting the Oracle. Orunla is the great benefactor of humanity and its principal adviser. He reveals the future through the secret of Ifa, the supreme oracle. Orunla is also a great healer. Whoever ignores his advice may suffer the curse of Echu (not a good thing). Orunla's favorite animals and objects include kola nuts, palm nuts, and crocodiles. His power object is the ifa board, which is a percussion instrument used in ceremony. A whisk of horse hair is also used to drive away evil. Offerings to Orunla should include yams and black chickens. sandalwood, musk, neroli, red sandalwood chips.